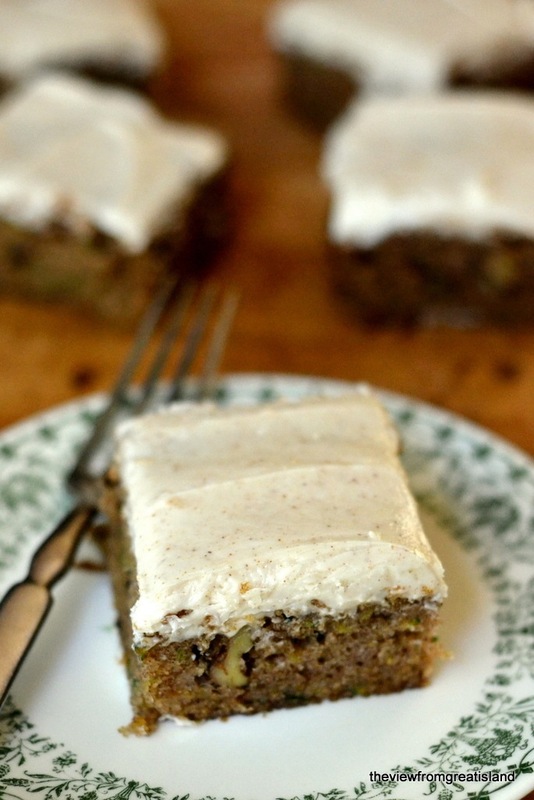 My Zucchini Cake with Browned Butter Frosting is moist, rich with nuts, and crowned with the most decadent frosting ---- zucchini never had it so good! Toss together the flour, baling powder, soda, salt and cinnamon in a small bowl. Set aside. Beat the eggs well and then beat in the sugar. Stir in the oil and vanilla. Add the dry ingredients and mix until just combined. Fold in the zucchini and walnuts. Spread the batter into a greased 9" square baking pan. I lined mine with a parchment paper 'sling' to make it easy to remove the cake for frosting, but this is optional. Bake for about 45 minutes, until a toothpick inserted in the center comes out without wet batter clinging to it. Cool on a rack before frosting. Make the frosting by melting the butter over low to medium heat in a small pan on the stove. It helps to have a light colored pan so you can see the color change. Continue to heat the butter until you notice it starting to turn brown. You may need to lower your heat at this point to have more control over the process. You will see the milk solids turn into little brown specks. Be extra careful not to let the butter burn, but let it get to a rich deep brown color. This happens quickly, so don't walk away. Let the butter cool a bit before adding to the sugar. Then thin with the cream until you get a spreadable consistency. Beat it until it is smooth and glossy. Spread it on the cake and enjoy.